Water damage in Alpharetta often occurs in the bathroom because of clogged or broken pipes. Even slow leaks that go undetected for a long time and high humidity levels from a poorly ventilated bathroom can necessitate water damage repair in Alpharetta. It’s important to know the dangers of water damage in the bathroom, especially if the damage is coming from water leaking from the toilet. The most obvious danger of having a backed-up toilet is that you’ll have a big mess to clean up if the sewer starts backing up through the toilet. In addition to this, however, if sewage backs up into your bathroom through the toilet you’ll be exposed to numerous dangers from bacteria and microorganisms in the sewage. This type of water damage makes it easier for mold and other dangers to lurk under the floor and behind the walls if the damage isn’t cleaned up properly. There are other ways a toilet can cause water damage besides backing up. The toilet can leak around the base and from the tank when parts start to wear out. Cracks in the toilet, bad seals, or broken flanges are common culprits for a leaking toilet. If you suspect your toilet might be damaged and causing leaks there are a few signs you should watch for in addition to calling a professional. A returning puddle on the floor by the toilet is a sure sign as well as a toilet that clogs frequently for no apparent reason. Hissing sounds or unpleasant smells are also signs to watch for. In some cases, you may notice signs of water damage before realizing something is wrong with the toilet itself. 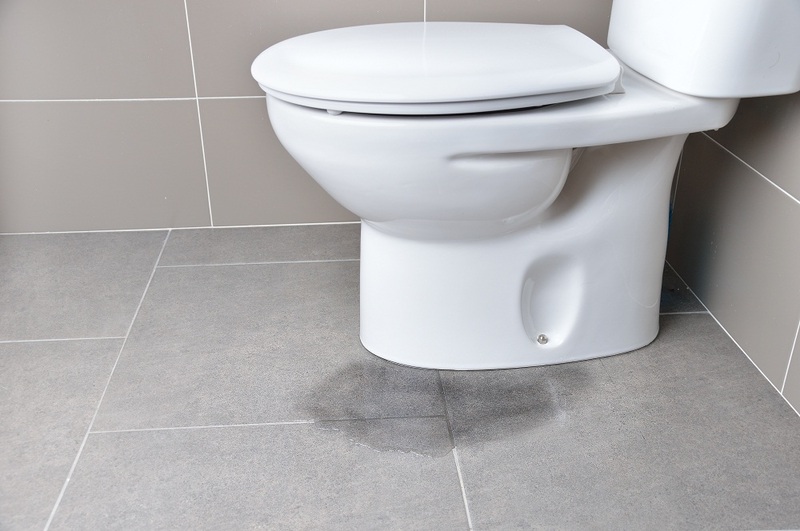 Signs of water damage from the toilet include blistered or discolored areas of flooring around the toilet. In addition, the floor may actually feel soft around the toilet. It’s important to inspect your toilet often to watch for these signs. Repair the toilet as quickly as possible and if you suspect water damage has already occurred, be sure to call a restoration professional right away in order to prevent further damage.